For British movie actor who starred in The Dark Knight Rises, see Tom Hardy. 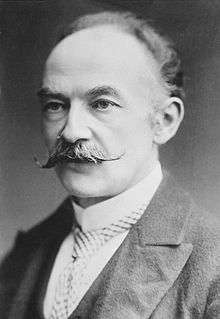 Thomas Hardy OM (2 June 1840 – 11 January 1928) was an English novelist and poet. In the United Kingdom, Hardy is generally thought to be one of the greatest figures in English literature.He lived in the Victorian era.During this time,Charles Dickens(who wrote A Christmas carol) was one of the leading authors. Thomas Hardy was born in Upper Bockhampton near Dorchester, Dorset. His father was a stonemason. His mother was ambitious and had read a lot. She added to his formal education. Hardy trained as an architect in Dorchester before moving to London to get a job. He won prizes from the Royal Institute of British Architects and the Architectural Association. Hardy wrote a small number of novels which earned him a high reputation in his lifetime. These include Tess of the d'Urbervilles, The Mayor of Casterbridge and Far from the Madding Crowd. After the publication of Jude the Obscure in 1895 Hardy gave up novel writing but continued to write poetry including an epic poem called The Dynasts. Hardy set his novels in South West England, calling it Wessex, and inventing names for individual towns, e.g. Casterbridge is Dorchester in Dorset. Hardy died in Dorchester. His ashes are buried in Westminster Abbey. This page was last changed on 29 November 2018, at 12:47.